Las Vegas suspect Stephen Paddock shot a hotel security guard six minutes before he opened fire on concertgoers, authorities revealed on Tuesday, significantly altering the timeline of events. Officials had previously claimed guard Jesus Campos was wounded after Paddock had opened fire on the country music festival overlooked by the Mandalay Bay hotel earlier this month. On Monday, Clark County Sheriff Joe Lombardo said Campos was responding to a report of an open door when he heard drilling from the room of the shooter. Paddock, 64, had installed three video camera to surveil the approach to his room. He opened fire through the door, wounding the guard, leading Campos to alert the police. 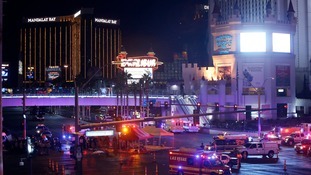 Soon after, Paddock embarked on a 10-minute massacre that killed 58 people, one of the deadliest mass shootings in US history. Authorities also revealed that Paddock planned to escape his suite by targeting aviation fuel tanks. The drilling heard by Campos was Paddock boring a hole into an adjacent wall, though police are uncertain why he did this. The shooter also bolted a metal bar on an emergency exit near to the door of his room, officials said. Authorities still have no clear motivation for the massacre. "We believe he decided to take the lives he did and he had a very purposeful plan that he carried out."